Shop the best satin gift boxes for your precious collections! You'll find lovely articles, on beige or blue, for many pieces of jewelry: from ring clips, earrings T-boxes & necklaces, pendant or bracelet cases and even pearl folders. 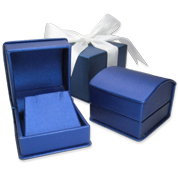 These items come with an outer case tied with an elegant ribbon. Get the best deals thanks to our wholesale discounts!